Please click here to read the newsletter if it does not display correctly below. "That God once loved a garden we learn in Holy writ. And seeing gardens in the Spring I well can credit it." 'Sango Kaku' - Brilliant red-coral bark and pale green leaves with attractive red edges that turn a vibrant, golden yellow in fall. 'Ukigumo' - Compact, upright tree with ethereal pale green, white, and pink-edged leaves. 'Shishigashira' - Compact, shrubby tree with curly green leaves that turn purple-red with orange-red patterns in the fall. They don't have their signature flowers yet, but hydrangeas are coming out of their winter dormancy! 'Zinfin Doll' - Heat tolerant, winter hardy, reliable and prolific bloomer. Pure white blooms open in early summer, then blush from the bottom with bright pink that develops into a rich red-pink. 'Bar Harbor' - New, compact form of the famed 'Annabelle', this hydrangea is perfect for smaller spaces. Masses of big, white flower heads put on a spectacular show throughout summer. Nothing is sweeter than sweet peas in the spring! These charming beauties love cool weather, so get them in the ground to maximize your time with them before the temperatures rise. 'Wiltshire Ripple' - Highly fragrant blossoms with chocolate to cranberry streaks throughout and along the petal edge. 'North Shore' - A Royal Horticultural Society award winner with bi-colored blossoms in stained-glass colors of rich claret and violet-blue. 'Cupani' - Heirloom variety with intensely fragrant, violet- and crimson-colored blooms. Marigolds may be the quintessential summer flower, but now is the time to get them in the ground! We have many marigolds in stock, including new pompom varieties popular for holidays such as Ganesha Chaturthi and Dia de los Muertos. Plant now so they are well-established and in full bloom when these holidays arrive! 'Taishan Orange' - Strong-stemmed variety with huge orange blooms that are 3" or more across. 'Taishan Yellow' - Large, bright gold blooms on a high-quality dwarf plant. Few summer vegetables are as highly anticipated as the tomato. With the weather warming up, we've been getting more and more shipments of tomatoes every week. Come browse our extensive selection of heirloom and difficult-to-find varieties, and get your garden growing! 'Michael Pollan' - Yes, THAT Michael Pollan. Named after the legendary food journalist and educator, these bi-colored tomatoes are a tasty blend of fruity, sweet, and tart, and are bred to withstand cool temperatures and fog. 'Stupice' - Sets easily in cold weather, with a wonderfully sweet flavor that tastes great fresh but truly shines when cooked into sauces or baked into tarts. 'Costoluto Genovese' - A standard in Italy for both fresh eating and preserving, known for its intensely flavorful, deep red flesh and fluted shape. 'Berkeley Tie Dye' - Delicious tri-color slicing tomato. Each color packs a different flavor punch, resulting in a spicy, sweet, tart tomato with good acid all in one fruit. 'Amish Paste' - Lovely, firm heirloom paste tomato. Deep red flesh is firm, not too juicy and the taste is a fine balance between sweet and rich. Cooks down to a rich, thick paste. 'San Marzano' - The standard paste tomato for many Italian farmers and chefs. Long, cylindrical fruit is filled with thick, dry flesh and few seeds. 'Sunsugar' - Named by Sunset magazine several years ago as the best tasting tomato in their trials for sweetness and flavor. Orange at their peak, these tomatoes pack in all the sweetness you can handle! 'Dancing With Smurfs' - True blue cherry tomato variety with small fruits that ripen to a deep purple-blue in sunlight. Nice cherry tomato flavor, good production. This year, we're excited to be partnering with the Lopez family to offer locally-grown heirloom edibles, grown exclusively from Baker Creek Seeds! The Lopez family aren't just passionate about plants, they're passionate about their community, too; all proceeds from their sales go to Second Harvest Food Bank. Just getting started with houseplants? Have a small space, and need smaller plants? We've got you covered! Come visit our Houseplant Room to find starter varieties of favorites like crotons, dracaena, spider plants, ferns, and more! Peace Lilies are here in time for Easter! These tropical, evergreen plants are both beautiful and easy to grow: a winning combination. Keep in a well-lit area away from children and pets, and keep the soil evenly moist. These funky plants are a botanical curiosity due to their apparent ability to "rise from the dead", even after completely drying out. Sold in their desiccated form, simply place your Resurrection Plant in water and watch it magically come back to life! A perfect Easter basket addition for kids, or for the inner child in all of us! Put The "Garden" In "Water Garden"
The start of spring signals the beginning of water plant season! Few things soothe the mind and delight the senses like a water garden, and it doesn't take much to get started. Whether your water garden consists of a container on the patio or a pond in the ground, we have the plants you need to make it truly special. Immortalized in art and celebrated the world over, water lilies are the crown jewels of the water garden. Many are deceptively easy to grow, rewarding you with beguiling blossoms from June through October. Each flower lasts approximately 3 - 5 days, opening in the morning and closing at night, ultimately sinking below the water in a final swan song. Cut the flowers as they sink to encourage future blooms. With dark green, heart-shaped leaves and quaint yellow flowers, this floating plant adds cheer and visual depth to a water garden. Native to tropical climates, it blooms between June and August. Like other floating plants, the Water Poppy helps shade your pond and fish, creating a safe haven from birds and otherpredators. This tropical floating plant forms velvety rosettes that look like small heads of lettuce - hence the name! It is extremely fast-growing, but makes an attractive addition to the water garden when its rapid growth is kept in check. Water lettuce is an excellent choice for novice water gardeners, with no serious pests or diseases to contend with. Create interest with variety. Plants with varying textures and colors will create more interest than plants that have the same growth habit or leaf shape. Go green. Create a soft, soothing space by using different textures and shades of green foliage. The combination also looks great when accented only by white flowers. Know your plant size. When planting your water garden, make sure to take the height and width of the mature plant into consideration, then allow enough space for it to spread out. Group plants together. Just like with interior design, group like plants together when planting to create visual impact, rather than dotting them all around your water feature. Consider each plant's needs. Be aware of how much sun your aquatic plants require, along with their planting depth. If you're not sure, ask one of our Nursery Pros for help! With the ever-quickening pace of modern life, traditional Japanese gardens provide a much-needed dose of daily Zen. Designed to facilitate peaceful contemplation, they strive to recreate nature as accurately and beautifully as possible, with elements of the garden imitating or symbolizing elements found in nature. The principles of traditional Japanese gardens are easily incorporated into even the smallest spaces. Asymmetry - A lopsided aesthetic that appears natural and free-form, while still creating balance through the repetition of some elements. Generates visual interest and a sense of movement. Enclosure - Think fences and gates. Japanese gardens are intended to replicate the natural world in a small space. Borrowed Scenery - Incorporates the background landscape into the composition of your garden, such as a mountain vista or tree in bloom. Balance - Achieved in a Japanese garden through equality and unity, rather than symmetry. Symbolism - Elements used to symbolize aspects of culture and spirituality. Example: cranes for longevity, pine trees for perseverance. Stone Lantern - In its original form, the different parts of the stone lantern represent the five elements. Originally used to line the paths of Buddhist temples, the lantern is now a classic sight in Japanese gardens. Temple Bell - An excellent, eye-catching addition to an otherwise simple garden design. Our replica Buddhist temple bells are sure to bring a special, meditative quality to your garden. Meditating Buddha - The statue style most commonly found on Buddhist altars, showing a seated Buddha with hands positioned in the cosmic mudra. For maximum effect, place the statue facing east, as the Buddha meditated on the rising sun in his search for enlightenment. Laughing Buddha - Known as the good luck, prosperity, or abundance Buddha, the Buddha is depicted in his later years as happy and with a large belly from an abundant lifetime. His hands may be raised over his head, supporting an imaginary Ru-Yi pot (bowl of plenty). Besides having spiritual significance, stones are used in Japanese gardens to represent mountains and hills, set decorative accents, and serve as the building material for bridges and pathways. Water is another central feature of Japanese gardens, in the form of both ponds and fountains. Ponds often represent real or mythical lakes or seas, while fountains symbolize the passage of time or provide a means of physical and spiritual cleansing. Don't want a water feature? Suggest the presence of water with elements like dry river beds and low bridges. Utilizing even a few of these elements goes a long way toward creating your own oasis of serenity. Add a few touches to your garden, and invite some tranquility into your life! On March 8th, 2019, a beloved staff member, Tally the dog, crossed the rainbow bridge. Born on June 10th, 2006, Tally worked at Yamagami's for 12 years. She is survived by her mom, Arlene, who also worked for the nursery. Tally served as the official greeter here at the store. She was so well behaved there was no need to keep her on a leash. She rarely barked, and was kind to every creature she met. She had a certain sway when she walked, a little swagger that let us all know she was confident in her work. She could often be found trying to sneak tomatoes off the plants in the vegetable section of the store. If we ever lost track of her, it was pretty much guaranteed that we would find her rummaging around the potted tomatoes. She was an expert tomato stealer. She also really enjoyed green beans in the summer, and peas in the winter. Yamagami's won't be the same without our four-legged employees. Tally was a cherished addition to our work family, and her presence at the nursery will be greatly missed. Stock up on soil! 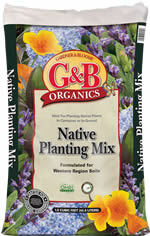 Going on now, buy 3 bags of G&B Harvest Supreme or Planting Mix, and get your 4th bag FREE! Mix and match the different bags as desired. April 14, 11AM - 11:30 AM | Tomato Talk | FREE! Let's talk tomatoes! Join our Nursery Pros for a conversation about tomato varieties, as well as tips and tricks to help your tomatoes thrive. April 21, All Day | Easter SALE! Choose a mystery egg upon checkout at the register and receive a discount: between 20% and 50% off your entire purchase! Here's a peek at what's blooming (and nesting) at Yamagami's this month! Since 1948, Yamagami's Garden Center has been committed to the promotion of beauty and the plants, products and friendly, professional support needed to attain and maintain that beauty. In my parents' footsteps (and Taro Yamagami's before them), I promise to continue that tradition. I invite you to visit us in the nursery and on our website, yamagamis.com for help in making your yard into a beautiful garden. Click here to subscribe, unsubscribe or change your address. For timely reminders about lawns, sign up for our FREE Lawn Care Reminder Service here. 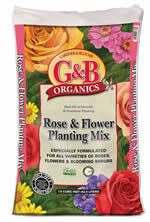 Use for roses and flowers for the best blooms possible. Ideal for CA natives and other water-wise plants. The perfect container mix. 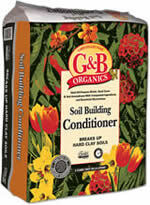 It drains well, yet retains just the right amount of moisture around tender roots. Finally, the perfect soil for raised beds! Grow better tasting, more nutritious fruit, with more abundant crops. 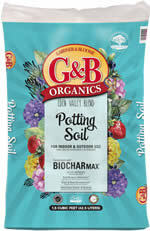 G&B Organics Eden Valley Blend Potting Soil with BiocharMax™. BiocharMax™ is a soft-wood biochar that provides soil, plant and environmental benefits. 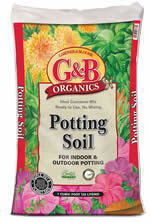 Great for in-ground projects including planting, amending, mulching or seed cover.